The Daily Express reported that Cavani is ready to ask Paris Saint-Germain to lower their £50m price tag to push through a move to Arsenal. The Uruguay international striker has been linked with a move to the Gunners in recent weeks, with suggestions that he likes the idea of living in London. 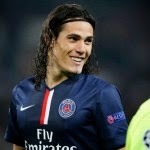 Publicly, Cavani continues to insist he is happy in Paris, but reports in Spain suggest he is now desperate to force through a move to England. Liverpool and Manchester United have also been linked with moves for Cavani, but the prospect of linking up with Arsene Wenger and Alexis Sanchez at the Emirates makes Arsenal the striker’s preference.